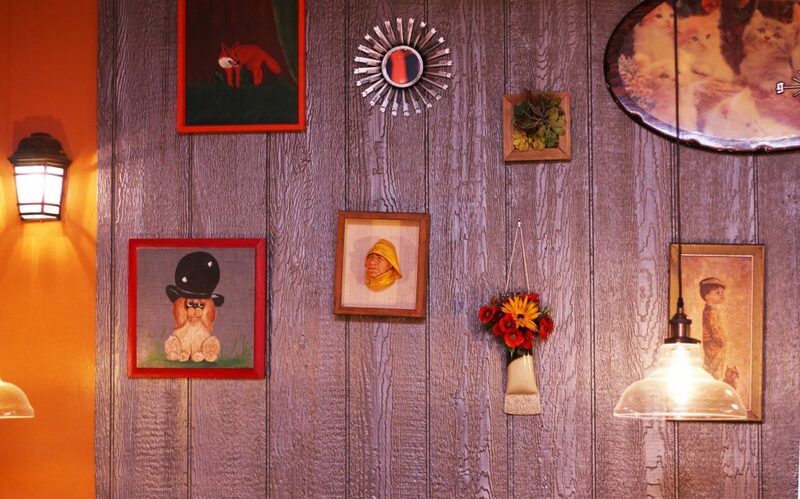 How could you go wrong when you choose an all-vegan, family-owned restaurant adorned with multiple cat clocks?! 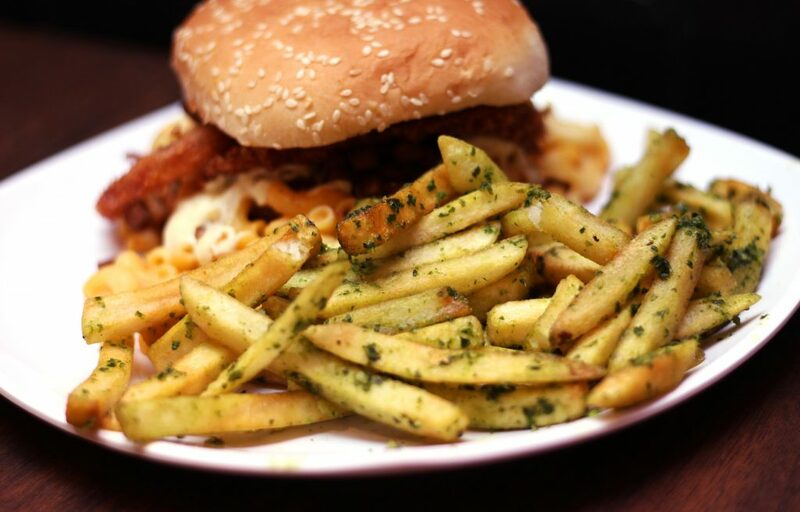 The Happy Hooligans is an all vegan, family-owned restaurant with all of the comfort food favorites that your heart desires, veganized, along with many Latin and Asian-inspired dishes. I had heard so much about this place from my vegan friends in the Bay Area and was so happy to finally get the chance to try it out- it exceeded my expectations! It is the perfect spot to bring your non-vegan friends to impress them with how delicious vegan food can be and how little they will miss out on. The service was great; we were seated immediately and the servers were so friendly, accommodating, and attentive. Their smiles and positive attitudes were contagious. We started off by ordering one of the most popular appetizers. 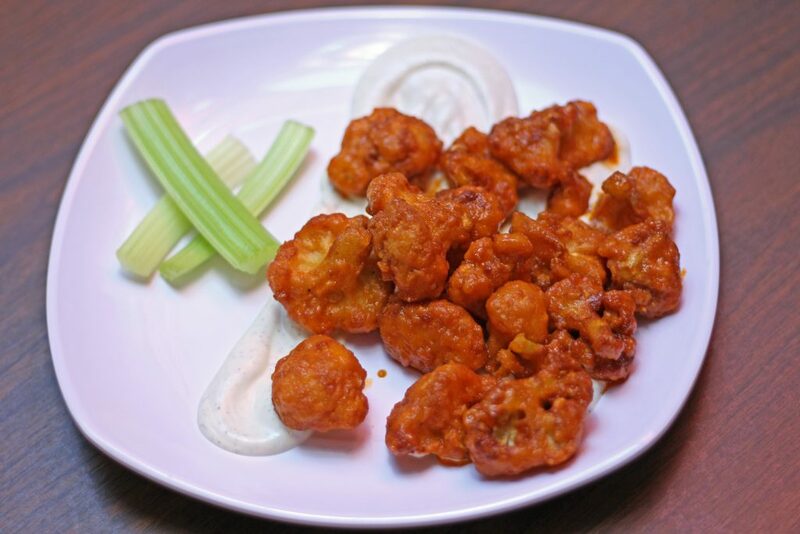 The buffalo cauliflower bites were the best vegan cauliflower “wings” that I have tried so far. They had a perfectly crispy batter coating that was so crunchy and did not result in a damp texture when covered in buffalo sauce. The cauliflower’s texture inside wowed me- I had to keep reminding myself that I was eating cauliflower and not meat or a meat substitute, due to its tender, yet hearty texture! Served alongside crunchy celery and vegan ranch, this was probably my favorite part of the meal I had here. For the main courses, we selected the Backyard BBQ Burger with a side of pesto fries, and chick’n flautas. The burger was my favorite of the two and would definitely be the choice to amaze your non-vegan friends when they ask you if you only eat grass, or some of my personal favorites, “but what about bacon? 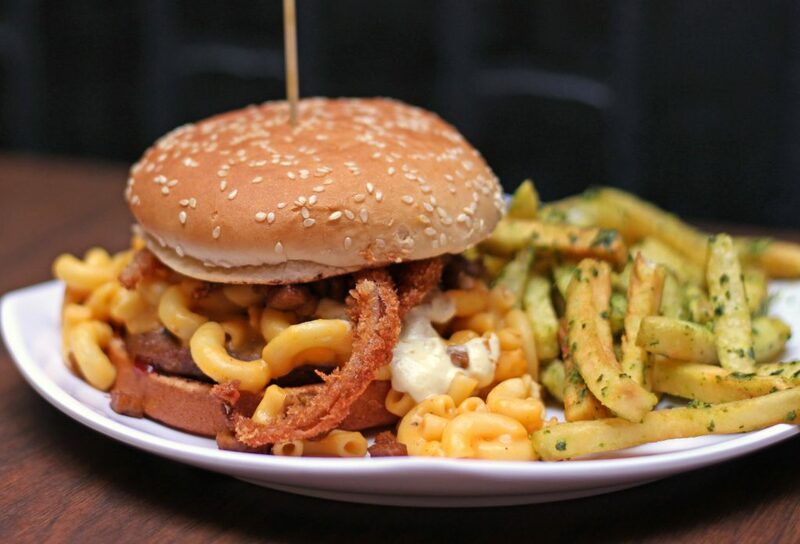 !” and “I could never live without cheese!” Well friends, not only is this meaty patty convincing enough to fool the most dubious veganism-inquirers, it is topped with onion rings, mac and cheese, AND bacon (all plant-based of course)! The soy-based “beef” patty was grilled to perfection in a sweet barbecue sauce. The texture was spot-on. The smoky bacon pieces were a great addition, and the onion rings were super crispy and sweet! The mac and cheese was irresistibly creamy, and when combined with a creamy, savory white “cheese” sauce that coated the burger, was enough to make a former cheese aficionado rejoice. I loved the pesto fries! They were crispy, not too heavy and the pesto flavoring was light, making them the perfect companion to any entree. 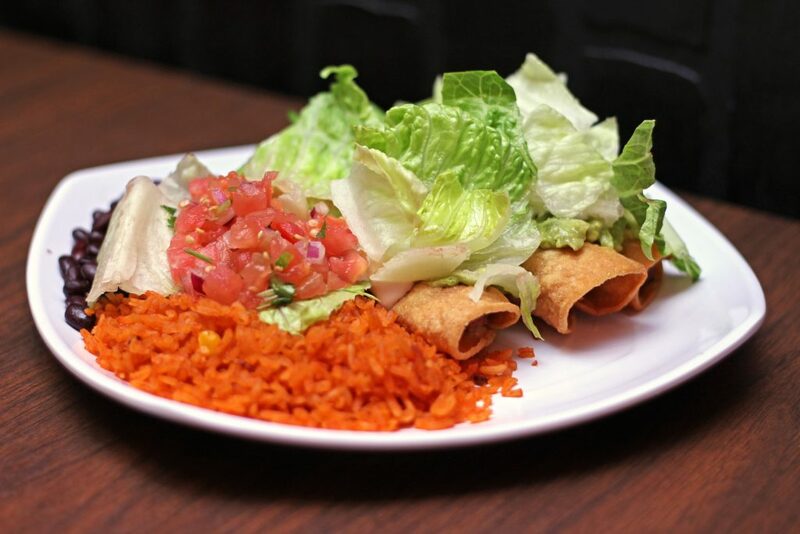 The chick’n flautas were served with “fiesta” rice, black beans, pico de gallo, guacamole, sour cream, and lettuce. They were good, but honestly I was not too crazy about them. The texture of the soy chick’n was a little dry, and they would not have been that flavorful without all of the toppings. I would not order them again because there is such a variety of delicious and more interesting options on the menu! I will definitely be back again to try some of the other “fiesta specials” like the jackfruit carnitas enchiladas or burrito, which I have heard many good things about. 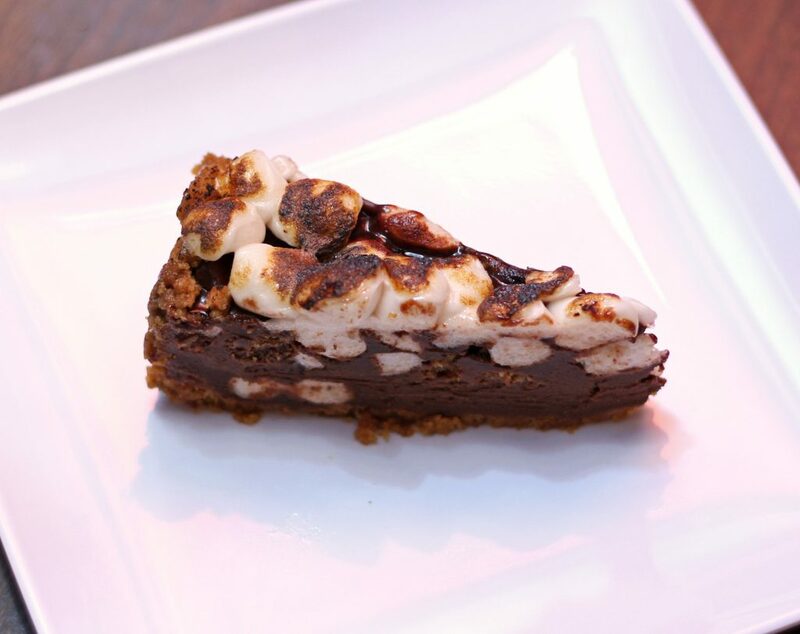 And for the finale- we ordered the s’mores pie! I did not know what to expect before I ordered it but I just saw the word s’mores and knew I had to give it a try. This dessert did not disappoint. 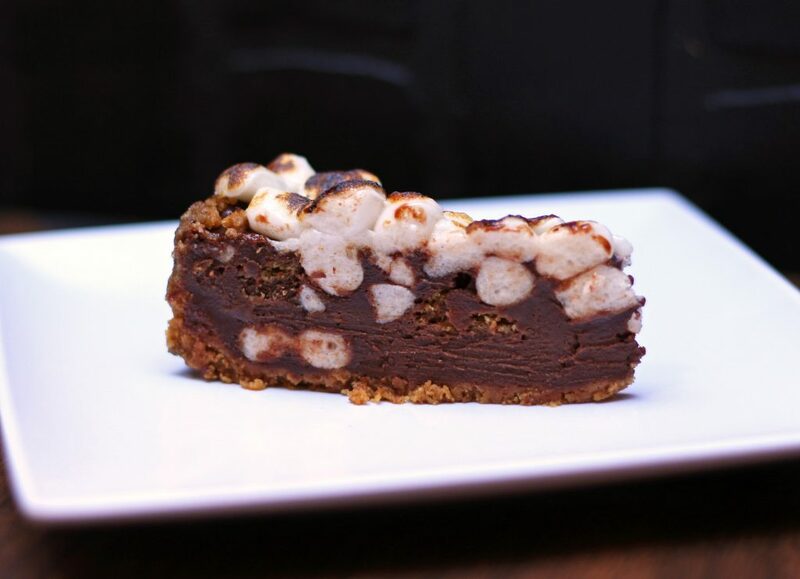 It had a buttery graham cracker crust, filled with a silky, creamy chocolate ganache base. It had graham cracker pieces and soft toasted marshmallows throughout the ganache, and was topped with more toasted marshmallows! The marshmallows were so gooey and their crisp caramelized exterior was to die for. This dessert was so good I had to include two photos to showcase all its beautiful, scrumptious angles- isn’t it dreamy?! I cannot wait to come back to The Happy Hooligans next time I’m in the bay! The service was excellent, they have an extensive menu of all the comfort foods you’ve dreamed of eating again after going vegan, made even better with creative twists, and everything was reasonably priced! This should definitely be on your list of top vegan eateries in San Jose if it isn’t already.